One of my go to tools with Royal Icing is so simple…a toothpick! 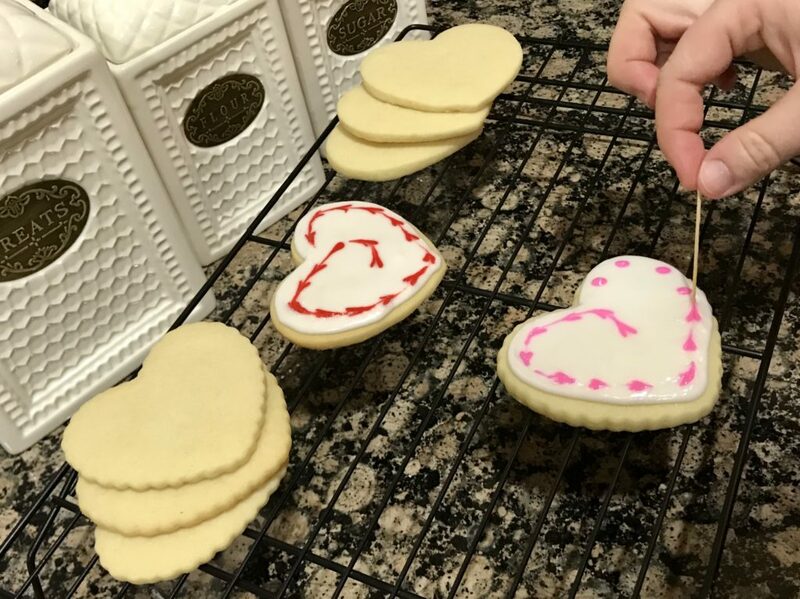 With just a toothpick and a couple of colors of icing, you can make a fun Valentine’s Day cookie! Your friends will think you’re the next best baker with your fancy icing! Mix yourself some royal icing and make sure it’s a good medium consistency for “flooding” the cookie. (this means covering the entire top of the cookie) While your icing is still wet, squeeze in some dots in any pattern you see fit in the flooded icing. Then take a tooth pick and slowly drag through the icing to create a little heart! Make sure to wipe off your toothpick with a wet paper towel in between each heart to make sure your hearts stay crisp and neat.